About a month ago, I spotted Dr Karl at a book signing in my local shopping centre. Part of me was desperate to talk to him and tell him how awesome he was. But part of me knew that he must get so sick of people fan splurging all over him. The second part of me won out, and I left the shopping centre feeling somewhat proud that I had made a very grownup decision. Dear @DoctorKarl, I want your job. Later that evening, my game of Scrabble (no, really) was interrupted by my phone. Several weeks later, I rolled up at the ABC in Sydney and presented myself to the receptionist. There was a space for “Host Staff Member” on the slip he had handed me. He handed me an ABC Visitor Pass and I wondered over to the sofas he had indicated. I immediately set about trying to take a stealthy selfie of me and my pass, figuring it would take the receptionist a while to find my host. Caught up in awkward angles and unflattering close-ups, my selfie taking was interrupted almost immediately. I find my way to the coffee shop without embarrassing incident, and am beckoned over to Dr Karl’s table by The Man Himself. (He’s wearing an Americana print shirt with a Route 66 belt buckle, for those of you who are interested. NB You should ALL be interested). After coffee, Karl gives me a Brief History of the ABC Ultimo Building. He moves with purpose and a near constant commentary of our surroundings. At this point in the day, this commentary regards the age and orientation of the building. However, at other stages of the day, it will instead focus on the pattern of the traffic lights, the speed of the elevator we’re standing in or who is currently walking past the recording booth. It’s actually very comforting in an odd sort of way. He takes me up to the third floor balcony space, where he can point out the ABC satellite dish. I didn’t have much time to think about how I felt about being spoken to like this, as Karl was already moving on with more detail about the technicalities of the ABC broadcasting systems…most of which goes over my head, as I am busy nodding and smiling*. He even leads me into the high security main control room, warning me not to touch any of the buttons or cables. As Karl sets up for his ABC 612 Brisbane segment, I am left with the guys in the transmission control room , as they tell me about their jobs keeping the entire country in touch with the ABC. They are quick to remind me that this task is a bit tricker in Australia than the UK, a country which can fit inside Victoria. Later in the day, Karl tells me that he enjoys having his “Tardis” (isolated soundproofed room) in such close proximity to these guys as he has a lot of respect for their profession and expertise. No kidding. I am directed into Karl’s Tardis, where he is sat with his laptop open and Skype running. He is about to go on air and one of the producers is typing messages to Karl on Skype, writing out some of the questions they have been texted, tweeted, emailed or called in. This is the first time I realise that Karl has literally no time to research the answers to the questions he is asked. Within a minute of Karl and the producer typing their “Good Mornings”, Karl is live with Steve Austin and answering questions about solar panel efficiency, towel drying and weight loss. Initially I thought the producer would continually type out questions on Skype for Karl to select, but often he was given no choice of which question to answer. Dr Karl is a sodding enigma. After the ABC 612 segment, we dash upstairs to the Triple J studios to join Zan Rowe for a one-hour Q&A session with callers to the radio show. Karl is quick to tell Zan off for partying too hard over the weekend at Beat the Drum, and they are left with about 45 seconds to talk about some of the callers they’ve had so far. With Zan’s show, the guys do get a break every few minutes while she puts a record on, and while they do use that time to discuss the upcoming calls, there isn’t much picking and choosing. Karl’s happy to tackle just about everything (however I did get the feeling that younger kids often got a preference…so feel free to recruit some younger siblings/ nieces/ nephews/ cousins/ passing school children if you are really desperate to get on the show). Although Karl was happy to answer any question, it’s pretty important to note that, like any half decent scientist, he knows when to say those magical words, “I don’t know!”. I show Karl during one of the music breaks, and he looks a bit concerned. He asks that Nikola send him some references and he’ll have to do some reading. When Nikola sends the papers through a few minutes later, he thanks me enthusiastically. This guy loves his scientific literature. He tells me he’ll read it through and correct himself next week. As the show comes to a close, Karl and Zan move outside of the studio to take their weekly picture. A few awkward moments pass as I’m unsure whether I’m supposed to be IN the picture or taking it. I’m more than flattered when Zan and Karl usher me between them and one of the producers emerges to take our photo. Which is now my phone, Twitter and Facebook background picture. Obviously. Again, I’m not given too much time to dwell on how this makes me feel, as he moves on to tell me about ACTUAL stupid people, like climate change deniers and anti-vaxxers, as well as conspiracy theorists. Karl lends me some magazines to read (National Geographic and Scientific American Mind), and I trot off to entertain myself for the next hour. Inspired by Karl’s dedication to science, I put down my smartphone, get out my notebook and attempt to really try to learn SOMETHING in the next hour. Note to self: it’s hard to focus when you are buzzing from exhaustive fan-splurge. We dash out for coffee. Without asking, Karl orders me an espresso and is somewhat distraught when I ask for a flat white instead. He insists that I at least TRY his, and justifies that his coffee must be nicer than mine because I’m not making “MMMMMM” noises anywhere near as loud as him, nor gesticulating anywhere near as wildly. As if to make a point, he draws me the chemical structure of caffeine, alongside that of theo-bromine (the “active ingredient” in cacao). They look remarkably similar, and, literally translated, theo-bromine means, “food of the Gods”. 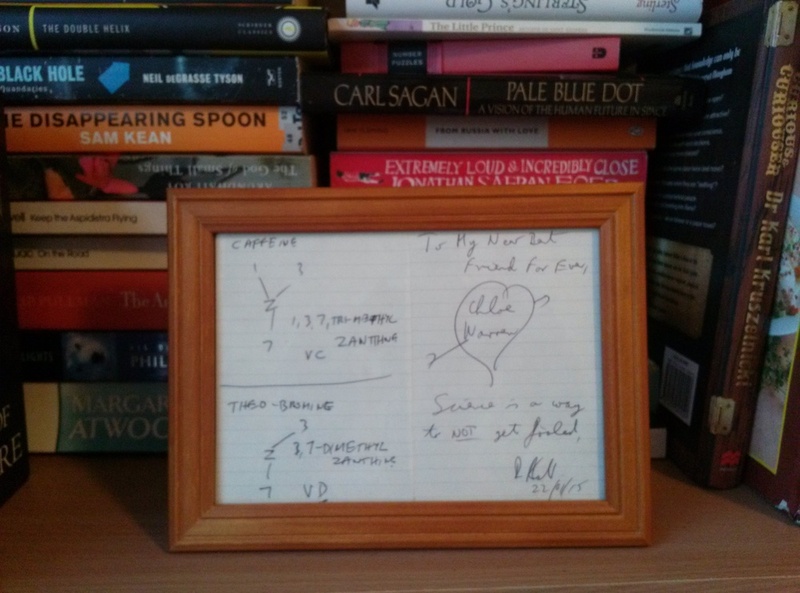 I ask Karl to sign his structures and he obliges (see, even HE doesn’t know how to spell his last name). We dash back into the ABC with about 30 seconds to spare before he’s live with Rhod Sharp on BBC Radio Five Live (fun fact: Rhod is actually broadcasting from Massachusetts, USA live to his listeners in the UK). The show goes for an hour, plenty of time for Karl to educate us on global warming, methods of investigating the Earth’s core, human cartilage, satellite highways and cheese dreams (NB Not actually A Thing). It’s during this show that I realise that Karl’s earlier Kardashian comment (and several others which could have caused offence) is really just part of his humour. He’s just so fast that you don’t often have time to realise that he’s being funny. At one point, Karl suggests that we stop women from waring out their cartilage by carrying them around everywhere. But in the next breath he’s telling us about dietary supplements which can actually aid cartilage health. Neither the host of the radio show nor the listener had time to laugh, because he’s tells these “jokes” with such confidence in exactly the same tone and manner as he when he talks science. …and I’m comforted once more. He really didn’t mean anything offensive when he had called me ignorant at lunch time, he was being purely logical. This is not the only occasion throughout the day when Karl is humble; one radio host introduces him as a, “genius”, and is quickly corrected. The average IQ is 100, and Karl’s IQ is just 110. And when I complimented him on his memory earlier in the day, again he was quick to “correct” me (I’m still extremely impressed). As we pack away for the day, I am regaled with instructions of how to recognise a “herpetologist” (a person who studies reptiles and amphibians will usually have a missing tip from one of their finger), as well as a brief description of Karl’s two daughters (one in high school, and another has just got a job in her chosen field, fashion and textiles). 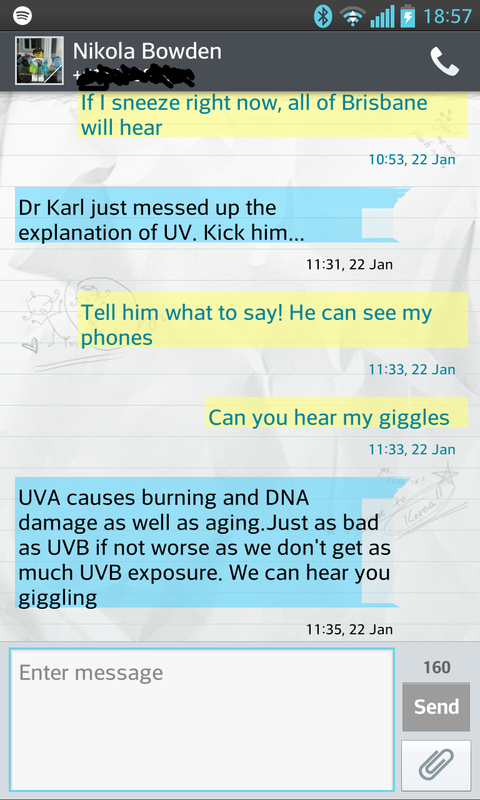 We bid our farewells, and Karl thanks me again for bringing some more facts about UV to his attention. I give him one last fan-splurge (THANKS SO MUCH FOR THE OPPORTUNITEEEEE!). He shakes my hand, I hand in my precious visitor pass and wonder back out onto the Sydney streets, day-dreaming about satellites, cheese dreams and ejaculatory sneezes. *I’m truly sorry that I didn’t understand what was going on. It was so clear that this was one of Karls’ favourite topics but Physics has always been my weak point. I know that’s no excuse. And I have been reading up on telecommunications since! But I’m definitely not confident enough to write about it yet.